The Air Park is a main community park and walking pathway in the center of the Comox Valley located on the banks of the Courtenay River Estuary near the communities of Courtenay and Comox, BC, Canada. Exploring the estuary is a very popular paved pathway used for hiking, jogging, rollerblading, dog walking and biking. Located along the pathway are many sightseeing benches, viewing areas and a lookout tower providing great views of the estuary, river and harbour. The surrounding marine atmosphere and the many viewing benches on the pathway create an ideal situation for birdwatching. Some of the bird viewing opportunities include spotting species like Bald Eagles, hawks, ravens, Blue Herons, osprey, Trumpeter Swans and other assorted seabirds. The Courtenay River Estuary is a spawning river for salmon. The salmon in the estuary attracts wildlife to the area for feeding. The fish attracts seals and some of the above mentioned predator birds looking for a quick, easy meal. The park circles around a small air field accommodating small, private planes at the foot of Comox Harbour. The aerodrome and air field in the centre of the park includes a 1800 foot runway, a floatplane base and a airplane repair shop. 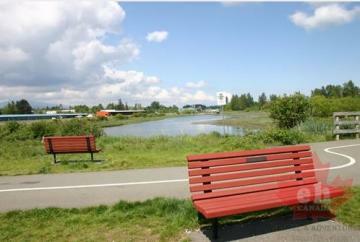 Public washrooms can be found between the airpark and marina. The park is a great place to watch the comings and goings of light airplanes and floatplanes. How to Get Here: Travel Highway #1 to the community of Courtenay, BC on Vancouver Island, BC, Canada. From the south end of Courtenay travel Highway #1 towards the downtown core. Before you reach downtown take a right (towards the harbour) after the Tourist Info Centre. Follow the road to a parking lot by the air strip on Mansfield Drive. There is more parking near the marina also.